In my never-ending quest to put healthy food on the table without going broke, I’m always looking for easy ways to cut corners without sacrificing quality. Perfect example – get my kids to eat more beans. Beans are cheap and healthy and we need to eat more of them, more often. That’s how chocolate hummus, cookie dough hummus and cake batter hummus were born. Oh yeah – and black bean brownies. But in order for my kids to eat more beans, I have to cook more beans. That’s why we’re talking about Instant Pot beans today. For years I’ve been making slow cooker beans. A few hours in the slow cooker (or up to 8 hours for my famous slow cooker refried beans), and you have a big batch beans ready to go. After crunching the numbers to see if dry beans were cheaper than cooked beans (and they are – here’s the proof), I’ll never go back to canned beans. Well, I mean I won’t go back to buying canned beans as a pantry staple. I’ll always have a can or two on hand for those “just in case moments,” but I’ll only buy them when they’re on clearance or on some crazy cheap sale for 50¢ or less per can (here’s how I got that number). I also like cooking them myself because it means less flatulence going on after our meals. 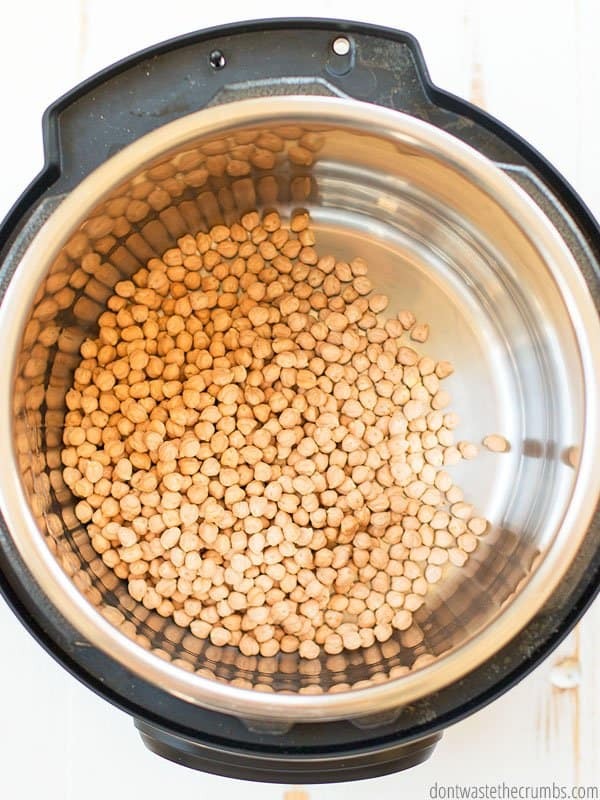 Here’s our method to de-gas beans, but I’ve found that when I make Instant Pot beans, I don’t have to soak them beforehand! But the biggest con to slow cooker beans is that they’re not foolproof. You can’t forget that you put beans in the slow cooker, in the garage, because the next day they’ll be overcooked mush. You should also still soak the beans. I don’t know the science behind it, but slow cooker beans are like stove-top beans in that they will make your family have stinky toots. For some reason, Instant Pot beans don’t give my family stinky toots. That right there is enough to win me over, but I love that Instant Pot beans are ready in under an hour. Even when you include the time to come to pressure and the pressure release, I have a full pound – or more! – of dry beans cooked to perfection in less than 60 minutes. That means I an easily batch cook lots of different beans in one day and be ready for the whole month, rather than taking a week or longer to soak on the stove-top (since I only have so many pots big enough to soak AND I still need some to cook meals) and then to cook in the slow cooker (I just have one slow cooker). 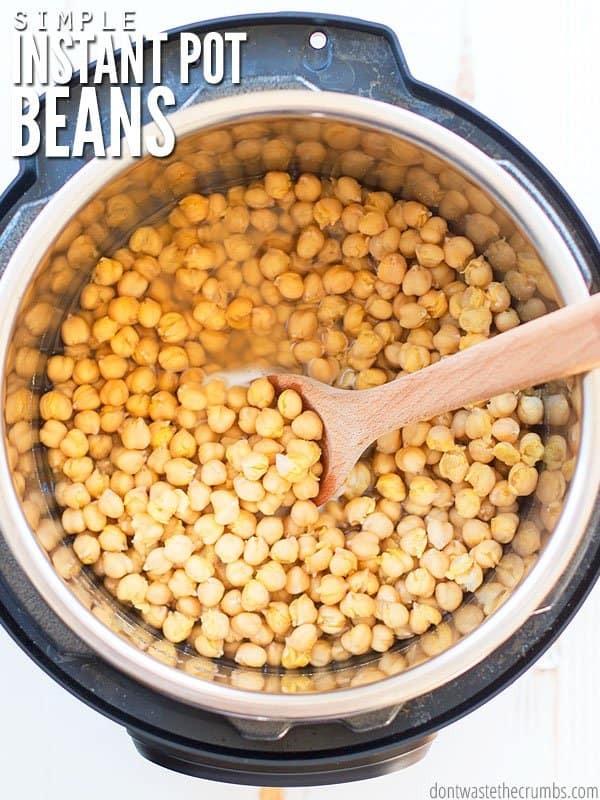 For me, Instant Pot beans is super easy, super fast and super practical for our busy lifestyle. You’ll notice that my recipe calls for a 35 minute cooking time. That’s the average. I ALWAYS cook my beans for 35 minutes when I need them to be firm yet perfectly cooked. These are the beans that will hold their shape in meals like southwestern salad and pumpkin chili. You can certainly cook them longer if you want to. When I make my refried bean recipe in the Instant Pot, I cook them for 45 minutes because a) they’re going to get mashed anyway, and b) I want as much of those flavorful juices to be in the beans as possible. I wouldn’t recommend cooking beans for any less than 35 minutes though, unless you’ve already done it successfully. I read that someone once cooked black beans in the Instant Pot in 20 minutes. Well, great for them. My black beans aren’t ready that quick and I’m not confident enough to tell you to follow their suit. But I am confident that 35 minutes will give you perfect beans, every time. This post is part of my Instant Pot Basics Series. It goes hand-in-hand with my 31 day challenge. Learn more about it HERE. What size Instant Pot do you have? I have the 8 quart DUO 7 in 1 Instant Pot. I choose the larger Instant Pot for a few reasons. My slow cooker is 6 quarts and can barely fit some of my favorite recipes. Having the larger Instant Pot gives me more room to double recipes. Cooking once and eating twice is key for saving time in the kitchen. I’d rather have extra room, than not enough! You also have to leave a certain amount of space in the pressure cooker when using it. There is a max fill line for liquids. And the general rule is to not fill the Instant Pot more than 2/3 full. The 8 quart gives me more room to cook. One Instant Pot hack I learned is to use a 6 quart pot on top of an 8 quart pot to cook two elements of one meal. You can read how that works HERE. How do you make slow cooker recipes into Instant Pot recipes? I shared a really great tutorial / tips article on how convert slow cooker recipes to Instant Pot recipes HERE. I haven’t purchased an Instant Pot yet – is there anything I should know first? YES! There’s a good bit of info you should know before you buy the Instant Pot. None of it’s bad, but it’s definitely worthy to read before taking the plunge!! Read the article HERE. Where do you keep all of your Instant Pot recipes? You can find all my Instant Pot recipes HERE. 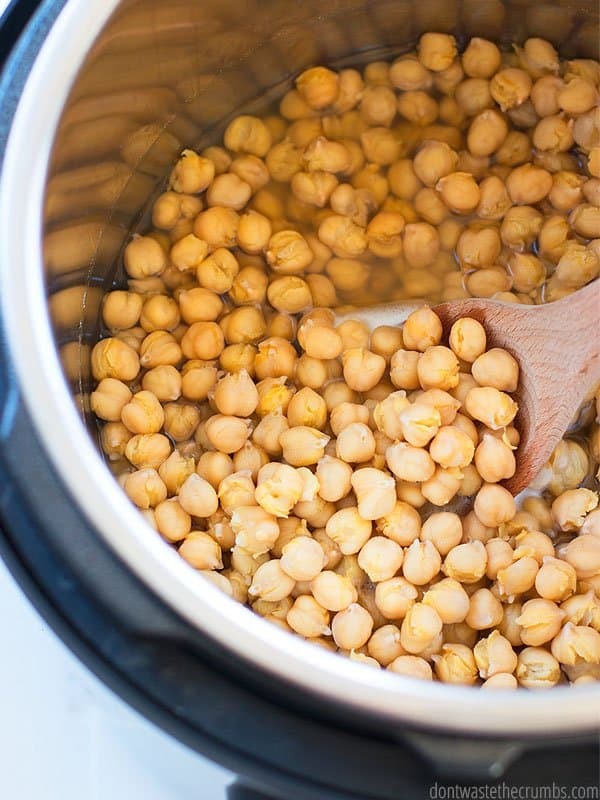 Place beans and water in the Instant Pot. Seal the Instant Pot and make sure the pressure value is set to "sealing." Press the "manual" or "pressure cook" button so that it is set to high pressure and use the "-" and "+" buttons to adjust the timer to 20 minutes. When the timer goes off and the beans are done cooking, use the natural pressure release (i.e. do nothing). Note: DO NOT use quick release when making more than one pound of beans. Once the valve indicator has gone down, it is safe to open the Instant Pot. Drain the beans and use in your favorite recipes! Anytime I make plain beans, I leave them absolutely plain. That allows me to use the beans in both sweet and savory recipes without a problem. Unless you are making a big pot of beans for one particular recipe, I suggest you make them plain as well. How do you cook your beans? Do you soak? Do you cook them on the stove top, slow cooker or pressure cooker? Leave your tips in the comments below! I was given an instant pot for Christmas and have been a touch intimidated by it… But this I can do! Thanks! Do you need to drain the beans to prevent stinky toots? Made a lb of Great Northern beans today using these instructions. I think I will reduce the cooking time for that type bean next time. Mine were rather mushy. It was nice to have such an easy method, though, that’s for sure! do you can or freeze beans when you batch cook a large amount? any tips for freezing and then thawing and using and not loosing the texture? I freeze them Anna, and if you cook them “al dente” (i.e. just until their done), they won’t lose shape. I’ve actually overcooked them and if as long as you don’t mash them or over-stir, they’ll be fine! To thaw, I either put it in the sink overnight, or in the microwave for a minute or two. Do you freeze them in their cooking liquid or drained? on brown beans when the recipe says to let it depressurize naturally, is that hard and fast or do I loose some cook time by relieving the pressure manually? Great post, does this work for any beans? I’ve recently purchased an instant pot but haven’t cooked beans from scratch and I’m quite new to using beans in my WFPB recipes. I have only so far used canned red kidney beans since they don’t give me, ya know. This works for any beans except kidney beans. Kidney beans have an enzyme that can be disruptive to the digestive system, so it’s best to buy those. But every other bean is fair game! I’m confused, what’s different about kidney beans? Are you saying you don’t recommend home cooking them, and to buy them canned instead? Hi Donna – yes! The enzymes in kidney beans are different than other beans, and so for safety and digestive concerns, I recommend buying them instead of making them. Hi is this recipe for pinto beans? And if so can I put ham or bacon in with the beans? This recipe will work for pinto beans Brenda, and you can put anything you want in with it! Since I was a little girl; we ate pinto beans in the juice they were cooked in. We would smash them just a bit to get flavor into the water. Is this a bad thing or not so healthy thing to do? Never ate beans drained. The juice was so good. Some people don’t have issues eating the water, but it causes digestive issues for some. If you enjoy the flavor, go for it! I am a kidney patient, so special attention is needed for my diet. In my case, I NEED to leach the pinto beans used for the delicious chili I make with the Instant Pot (bought when there was no 8 quart pot.) Problem is, no one can answer how much potassium is lost in the leaching process, and whether repeating the process, additional leaching would result. I went to all kinds of health sites. Yes they all advise leaching, but none would say how much potassium is leached out. As a tip for those who make chili (from pinto beans), I add a bit of red wine, about a tsp of sour cream (low fat) and some smoke spice, all at serving time. Absolutely delicious! Thanks for your answer and, if possible, send me an email duplicate. John. Hi John! Exact numbers are hard to come by, but my friend Katie has done significant research on this topic. Start here: https://www.kitchenstewardship.com/soaking-grains-an-exploration/ and feel free to explore her site! 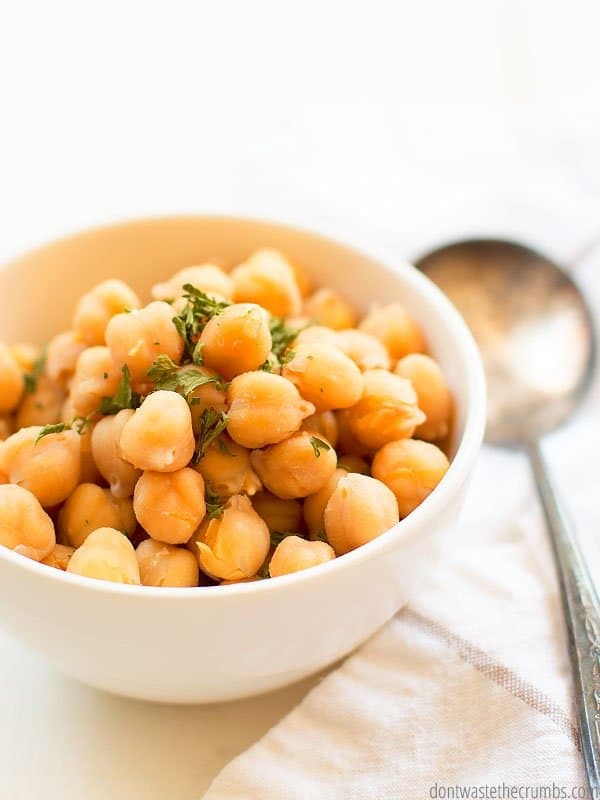 As a sequel to my first writing: all your pictures exhibit garbanzo beans. Where can one find dried ones? 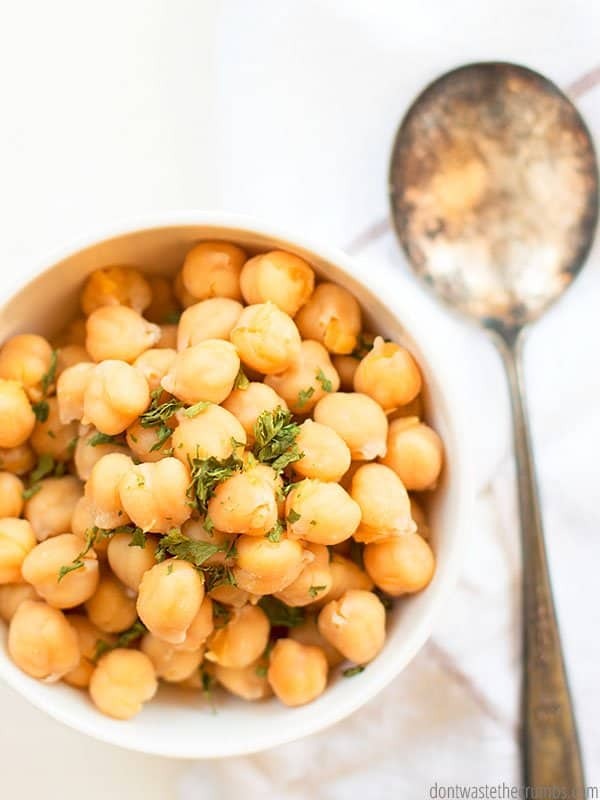 I get dried garbanzo beans from Walmart or any grocery store. Thank you! I am highly inspired to get my Instapot out and USE IT! No more intimidation!! My biggest problem with garbanzo beans is getting the skins soft enough to puree and make creamy hummus. When you’ve made yours did you have any issues with tough outer skins? Maybe I didnt use enough water. Hi Debbie! I have a Blendtec blender, which pulverizes the outer skins so it’s not an issue. If you can’t get the skins off easily, I’d suggest cooking a little bit more. Lately I’ve been cooking beans at 20 min with natural release (which is required when making more than one pound at a time), but if you cook for 25-30 min w/natural release, I’m pretty sure those skins will come off easily!